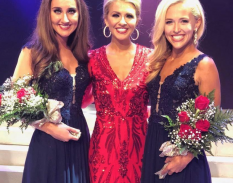 QUICK JUMP: Contestants Pageant Information How to compete in Miss Mississippi 2019? Miss Mississippi USA will go on to compete in the Miss USA pageant and, should she win the national title, on to Miss Universe. The Miss Universe Organization empowers women to develop the confidence they need to achieve their personal best. A confident woman has the power to make real change, starting in her local community with the potential to reach a global audience. We encourage every woman to get out of her comfort zone, be herself, and continue to define what it means to be Confidently Beautiful.